Sage recently announced the launch of their newest payroll application called Sage Time. In this article, we’ll take a look at this time and attendance management software that works hand‐in‐hand with Sage HRMS. Sage Time is an intuitive, web‐based “cloud” solution that completely automates time and attendance management. Beyond simply collecting attendance data, this full‐featured suite also provides accrual tracking, a time off request tool, employee and manager self service, reporting dashboards, customizable process workflow, and so much more. Time tracking and payroll processing represent a significant cost for many companies. Especially when HR or payroll staff has to manually enter data submitted by employees into the payroll system. The effort involved (and potential errors) can add significantly to your labor costs. So when you automate time tracking with Sage Time, not only is it much more accurate, you also keep processing costs under control. And with a long list of labor laws and regulations like FLSA, built‐in audit trails provide peace of mind that your timekeeping policies are consistent, up to date, and accurate. 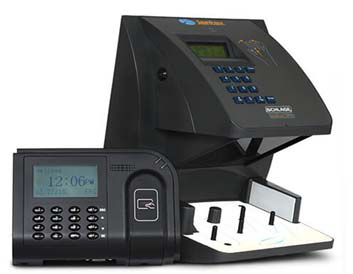 Sage Time also offers a wide selection of registration devices such as various badge terminals to avoid “buddy punching” through the use of advanced biometrics. 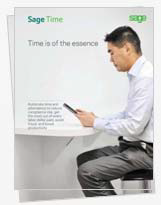 Sage Time mobile can capture data such as GPS location, geofencing, picture, group punch, employee messaging, and facial recognition (facial recognition currently available on Android only). Sage Time is delivered from the cloud as a SaaS solution and is integrated with Sage HRMS and Sage Payroll so it works with the employee data you already have. And there’s no need to purchase servers or install software. Contact us to request pricing, or any other information on how Sage Time might help your organization.